Quinlan, TX – Doobert.com volunteers transported two rescue kittens from Lugoff, SC to their forever home in Quinlan, TX this past week. Construction workers found kittens Mixer, Digger, Dozer, and Skidder in construction equipment on site. They contacted Cat Around Town Project based out of Elgin, SC to find a place for the kittens to stay. A volunteer from Cat Around Town stepped up to foster the young, lovable kittens and within a couple weeks, Mixer and Digger had an interested adopter. 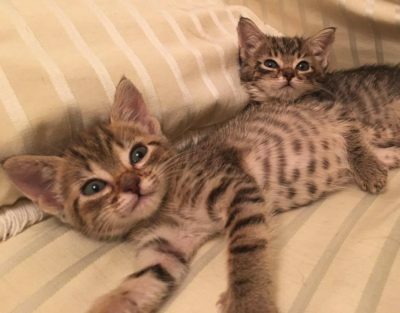 Since this adopter lived in Quinlan, TX, the rescue needed to find a way to transport the two kittens over 1,000 miles. Cat Around Town volunteers turned to Doobert.com to set up this trip and find volunteers to drive the kittens on this rescue relay transport. Thanks to the volunteers and Cat Around Town Project, Mixer and Digger arrived safely and happily to their forever home.